The quickest, easiest, most enjoyable method for learning to play the mandolin! 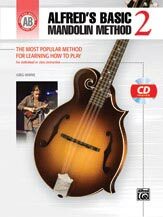 Alfred's Basic Mandolin Method is one of the many new additions to the Alfred's Basic family of methods, featuring clear, well-paced instruction. Learning to play has never been easier or more fun than with Alfred's Basic Mandolin Method---the best choice for today's beginning mandolin students. • Songs include "The Entertainer," "Tarantella," "Greensleeves," and many others. The included CD provides performances of lessons and examples.